Every organization should have several factors in place to set themselves up for success. You’ll need the right information, attitude, and processes. Know your organization, how you will communicate that to your audience, and how you will follow up with potential candidates. Remember that job fairs are a two-way street—it’s about finding and having a dialogue with a candidate who can both benefit from and contribute to your company. 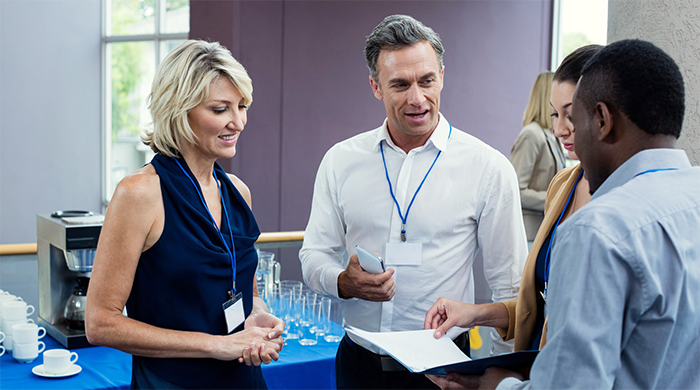 Here are some things to keep in mind as you prepare for your next recruiting event. Like any form of communication, you should know who you are talking to. For job fairs, identify your target audience of potential candidates. You can develop audience profiles—information that will help you tailor your message to the specific group of people that you are addressing. Think about their interests, experience, goals, and needs. For example, the people attending a job fair at a four-year college are different than those attending an event open to the general public. In the first case, attendees are most likely looking for entry-level, corporate positions with attractive company perks and opportunities for career advancement. On the other hand, people attending a fair open to the public may be looking for different levels of employment, from service jobs to senior management positions. You know how job candidates are encouraged to have an “elevator pitch” to quickly communicate the value they bring to the table? Well, your company should have the same thing. Know who you are, what you do, and why you do what you do. Be able to verbalize that information (here’s a helpful article if you want to learn how to write an elevator pitch) and be ready to answer any questions that come your way. It’s recommended to have printed materials (like company brochures and details on job descriptions) for candidates to keep. You may also want to prepare a sheet of talking points for your team to make sure all major points are being addressed. Don’t set up a table as a barrier between yourself and job seekers. Push the table out of the way and against the back wall of the booth. Determine ways to stand out from the crowd. Use videos, interactive games, or memorable giveaways stamped with your company website and logo. The goal is to make your company memorable to applicants and reflect your company culture (e.g. fun, innovative, etc.). Make sure to stand, smile, and come across as approachable. Refrain from using your phone, exclusively talking to your coworkers, or working on a laptop. Candidates are less likely to approach if they feel like they’re interrupting you. Dress in a way that reflects company culture and wear a name tag so you’re immediately identifiable as a company representative. Here are some other ideas to help your booth stand apart! Remember that table you pushed to the back of the booth? Use it to hold promotional materials you brought along for the ride. In addition to business cards, feel free to hand out brochures, info sheets, or other materials that help people become familiar with your organization’s functions, goals, and corporate culture. Candidates are likely visiting a large number of booths and receiving handouts from many different organizations. With that in mind, you’ll want marketing materials that stand out. Your goal is to represent your company and opportunities well, and make a positive impression on potential candidates. Consider putting together a packet that specifically addresses your organization’s hiring process and other information potential candidates might want to know. You can talk about company incentive packages, perks, and amenities. This can be helpful so people know what to expect if things start moving forward. To share a personal anecdote, in the past I would walk away with a bundle of brochures and print-outs from various companies when I attended a job fair, and I still distinctly remember some of the companies that had innovative and engaging marketing materials. In fact, I still have some of these items years later. Don’t underestimate the impact that these materials can make on a candidate. Capitalize on this opportunity to grow brand awareness and interest in your organization. With a well-prepared job fair presentation, chances are you’ll have a ton of resumes to work through. Sorting through the paperwork can be time consuming, but there are steps you can take to ease this process. We suggest having a job fair workflow in place. What does this mean? Simply put, it means outlining a process to help reach your end goal of filling those open job opportunities. This workflow should start before your team attends the event and will continue on after the job fair is over. Gather your team to brainstorm and develop this workflow. You’ll want to establish and describe each step in the process as well as who is responsible for each task. Have team members review the information about open job positions. Create file folders for the open positions. When you talk to candidates, put their resumes in the appropriate folder. Take notes on resumes while you’re speaking with candidates. You can even rate them on a scale of 1 to 5 so you can follow up with the most promising individuals first. Maximizing the benefits of a career fair doesn’t just take place at the event. This is just where you get the ball rolling on exciting opportunities to bring talent onboard. Set up interviews on the spot with the most qualified and promising people. Contact potential employees 24-48 hours after the job fair. Email or call candidates to dive deeper into their experience and skills to see if they meet your company’s needs. Send a thank you note to potential candidates. Sometimes candidates may even be the first one to reach out to you. Whether you or the candidate initiate contact, respond to messages promptly. Don’t leave the most promising people waiting or wondering for too long as that creates the possibility that they may be hired by other firms. These tips can help make sure that job fairs are productive and successful for your company. When done right, you can end up with a list of candidates who are not only actively seeking employment, but also have the personalities, passions, and skills to positively shape your organization. Reaching Further: A company’s culture is always a point of discussion when potential employees are looking at different career opportunities. When you are working with a team for eight or more hours a day, it’s important to understand your peers. Promote a culture of communication and collaboration by harnessing the power of personality assessments. From helping a new employee find their place on the team to strengthening a company’s culture, The Birkman Method delves into a person’s unique external behavior, what they expect from their environment to be productive, and what motivates them. With this knowledge, individuals and teams can tap into what helps them best contribute to the organization as well as develop an environment that is attractive to potential employees.